Well I bought a new truck a month ago and got my console installed last night. 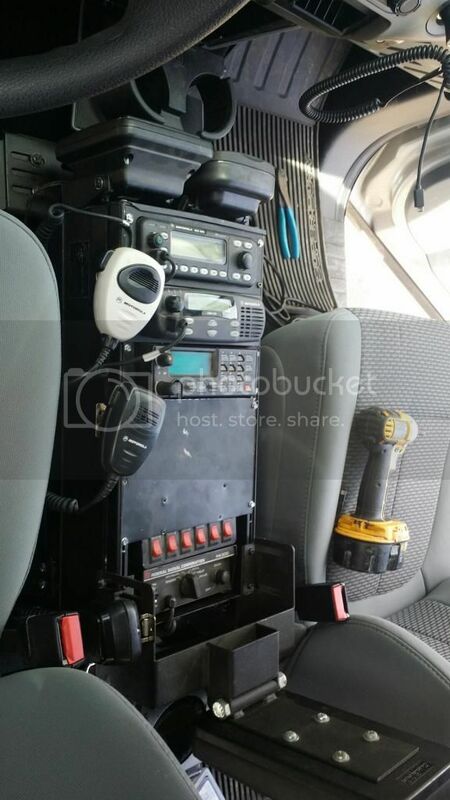 I am still waiting on another bracket for another cdm750 to be installed as a tac radio and also I have some cup holders coming for it as well. Since I had the seats out to install the brackets I ran the wiring under the carpet to keep it hidden. I will post more pics after the bracket and cup holder comes in. I will try and post the pics later of the lights and antennas also. Last edited by SoCalRescue on Mon Oct 20, 2014 2:09 pm, edited 1 time in total. BigTex1136 wrote: Well I bought a new truck a month ago and got my console installed last night. Lookin' just fine! I am glad you found a console to fit. I do have a CDM face panel for a Troy console if you haven't found one already. Yes, looks great. Looking forward to the antenna pics! Well I have been busy as hell but I got everything installed and done for now. 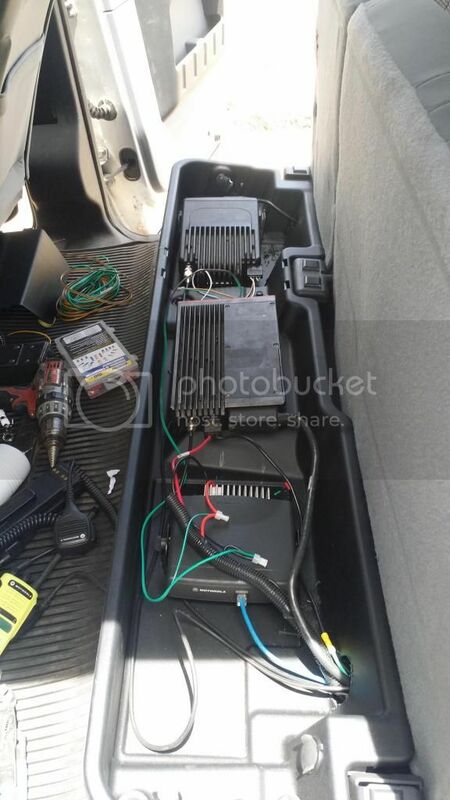 Here are the pics of the radios that are installed under the back seat. Its a nice safe hiding place too that you can also lock. 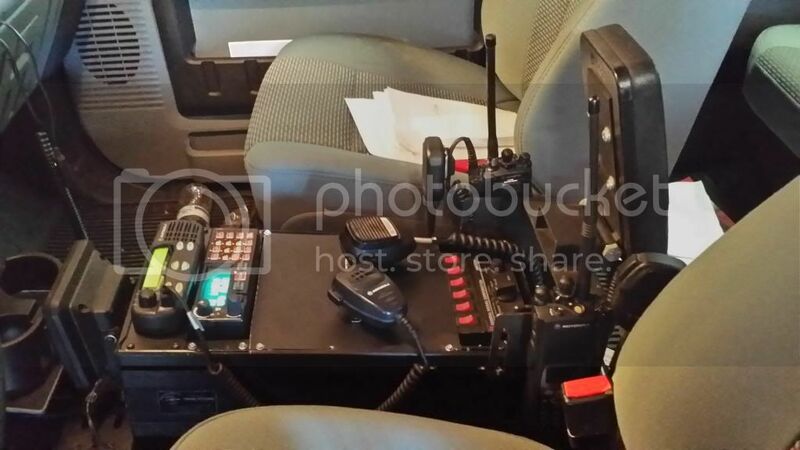 The console has all 3 radio heads and switch box for lights and siren controller. All said and done it is a nice install that works for my needs. Even installed rear cup holder lol. Roof is also done. The front antenna (Coke Can) is tac radio CDM1250, 2nd is 800mhz, 3rd is for the main radio the Motorola MCS2000 in the back. I was told by many people they were not happy with the coke can antenna there in the dront. I will say I tried it out for a bit on the main radio and yes I could notice some loss but over all was not bad. When our dispatch uses our local repeater works great, when they use the repeater up north it was spotty and with the whip antenna its understandable but not 100% clear. So over all I am happy with the coke can. And its really just going to be a tac radio. C-, bad choice of antenna locations: no ground plane for the VHF antenna. The 'back' antenna is way too close to the edge of the roof. Swap the 800 ant and the VHF ant to get more closer to the required ground plane. You need 1/4 wave minimum in all directions from the mount. Even 800 mhz antenna would need 3 inches from any edge. Easy fix. Just swap the 800 and the VHF in the rear? thank you for the information about the Ground plane I was wondering about that myself. OP, That Blue network cable stuck in the side of the CDM... did you make that? do you have any issues? I was thinking of going that route but for the under $20 price (when I checked last) price from Moto Online I thought I can go wrong. Thanks for the input. I don't have any issues all around. 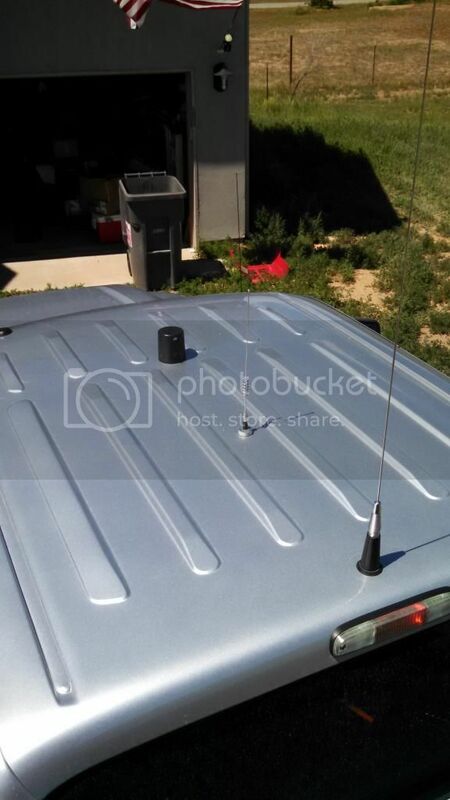 I know the back antenna is not 100% but works well. You see it all the time. As for the network cable on the CDM it works great. 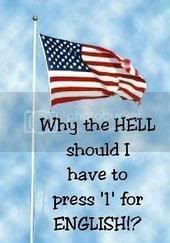 I have never had any problems. Its 15ft long and works great. ok I was curious.... I was thinking of making one but the prices were so cheap it was easier just to buy a few of them. glad that everything is working out for you! Well we can log that into the Murphys Law style of antenna theory. If it works F*^! it it works.